Disneyland Paris released this new concept-art showing the inside of Bistro Chez Remy, a new table service restaurant set to open the same day of the WDS Ratatouille ride, on July 10. 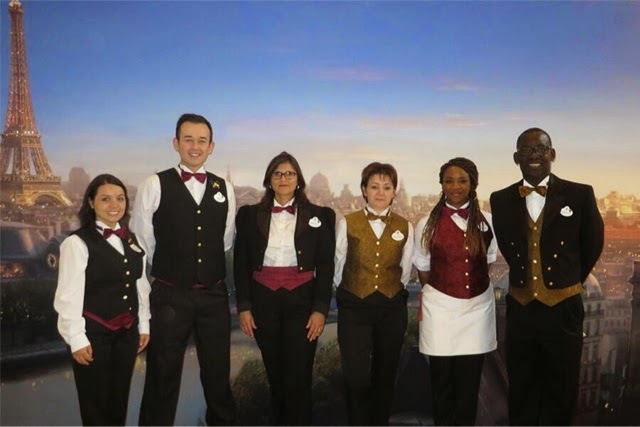 They've also released the picture below showing the costumes of the cast members who will work on the ride or in the restaurant. As you can see on the artwork, Remy and his friends are supposed to appear while guests are having dinner. Will it be the case? Probably - after all, a bistro called "Chez Remy" without Remy wouldn't have any sense, so expect some Ratatouille characters during your lunch! Delicious French cuisine, like that presented in the Disney•Pixar film Ratatouille, can now be enjoyed by all in Bistrot Chez Rémy, a themed table service restaurant inspired by the world and recipes of the film. The upscale, but light-hearted 370-person restaurant is the creation of Rémy, the rat who loves to cook, and is located in a new corner of Walt Disney Studios Park that's been transformed into a Ratatouille-themed version of The City of Light. Join us for lunch or dinner at Bistrot Chez Rémy from 10 July 2014. Bistrot Chez Rémy will welcome guests into a world where they are shrunk to the size of rats immersing them in an oversized world where jam jar lids serve as table tops and champagne corks are turned into chairs. Designed by Rémy and his friends, the restaurant also features everyday human items made large like paper cocktail umbrellas turned into parasols, giant cookbooks standing on end, and plates used to separate seating areas. On the menu during this Ratatouille-inspired experience, Rémy has prepared a unique menu that includes entrecote, chips, and of course, ratatouille! The "little chef" recommends a seasonal salad to start and a choice of dessert: a selection of French cheeses, including Brie de Meaux, and a fruit salad. Bon appétit! Honestly, I'd rather eat in a Gusteau's restaurant. Do you know what will happen to the Ratatouille theme in Rendez-Vous Des Stars? When will they start taking reservations for the restaurant?